10 min Yoga For Self Care invites you to take 10 min of your day to practice self care and love of self. We spend a lot of time on our phones, computers, in traffic, working and taking care of others. Take TEN to tend to your mind and body with this practice that combines yoga asana, breath and massage. Move in a way that feels good, tend to your heart space and cultivate self love with this 10 minute loving, healing, mindfulness practice. I’m hooked on yoga ,,kickboxing for nearly 20 years was fighter now instructor but this has took my core strength to new level and I’m only on day 13 of yoga revolution ..
Adriene, thank you so much! I feel like you always know just what I need. <3 I am going through a lot of self-discovery lately, uncovering codependent patterns in my life, and tending to my own needs is something I am learning to practice. Thank you always and always. I have been following the February Calendar and I just love it!! I will incorporate these new videos as time allows. I am beyond happy that you are here and reaching out to us with these unique practices. Thank you for the Revolution, it was a life changing experience. Much love. I do have a tiny request for some postures you can recommand concerning some tensions I have quite often these last couples of days juste between the shoulder blades. I try to stretch gently and mindfully as often as possible but it doesn’t really help to release those tensions. Lot of love and hugs!! Not sure if this is the best method to reach you, but I figured I might as well give it a shot. I’m from St. Louis and visiting my brother in Austin this weekend (Saturday through Tuesday). We both love your videos/you – I’m on day 28 of yoga revolution and it’s amazing. Anyway, we were hoping to go to one of your classes but I don’t get in until Saturday afternoon :(. Super bummed we won’t get to meet you, but maybe i’ll send my brother in my stead one day! Thanks for everything!! I was wondering if you have a favorite brand of Yoga Mat? I mostly do your Yoga videos at home but am starting to venture out to a studio. Thanks. This is just what I needed. Adrienne, I have to say that you have changed the quality of life for me on this planet. Thank you so much for your efforts, your love and your guiding ways. ALL your videos are wonderful. Gratitude from the bottom of my heart, and strength to you always! This was perfect for when I have a small amount of time for yoga and need to take my dog for our hour long walk. Need to stretch first. Thanks for this one, Adriene! Just when I was feeling down I received the e_mail from you Adriene. The message that we all have a right to be happy gave me hope. The yoga quickies really help on those no time days, and keep my mind and body connected. They remind me to be posutive. Keep them coming. Hello Adriene from Alabama – Great video to get my day going and more importantly, back on track after five days of neglecting myself. Really needed this 10-minute refreshment. Thank you, thank you, and namaste! Still on the mat Adriene. Doing Yoga with you every day either the 30 days of Yoga or the weight loss videos. Love It. Thanks Adrienne for helping me through a rough January and giving me the tools to heal, mentally and physically. Love you (love me too). I was wondering if you’d be able to do a series that leads up to a headstand. I’m nowhere near ready for that, but it’s my yoga goal for the year. Thanks again for everything you do! Just what we all needed Adriene! Thank you you Sweet woman! i pick a few short practices interspersed with a quickie. very satisfying. Adriene, you seem to know what is needed before i can ask for it. Thanks, love your sense of humor! Love getting these emails! Always keeps me pushing myself to keep practicing and make time for myself. Adriene, Thank you for these quickies. They are fabulous!! Sometimes I can’t commit to even 20 minutes but these are perfect. I so look forward to the new videos, scrolling through the old, and reading the emails. I am in a rut with my running, so yoga is helping me not to feel so bad about this phase I know I can work myself out of. I sometimes crave yoga, and I am so glad to have so many choices. The Balancing Flow was really wonderful today. Adriana!!! Estoy demasiado agradecida al universo por haberte puesto en mi camino. Sé que muchas veces me siento defraudada conmigo misma y es triste. Sé que mañana podré volver a verte y empezar de nuevo. Gracias absolutas por lo que haces por mí. My innermost human appreciation to you and the mission you are devoted to. The love you live and its bridges that you are spreading and by that reaching all of us…, its so damn wonderful and powerful! Currently I’m re-establishing self care for my thin body and guess what 🙂 – quickies are the perfect thing for my re-established to do list. Wish you nice week ahead! Got your email this morning and immediately did this. Thank you, thank you, thank you. Much love sent to you and the Yoga with Adriene community. Yesterday, I was about to recommend your youtube channel to someone and as soon as I said my favorite yoga teacher on youtube, she said it is yoga with adriene? Yes!!! Love these little spurts of yoga! 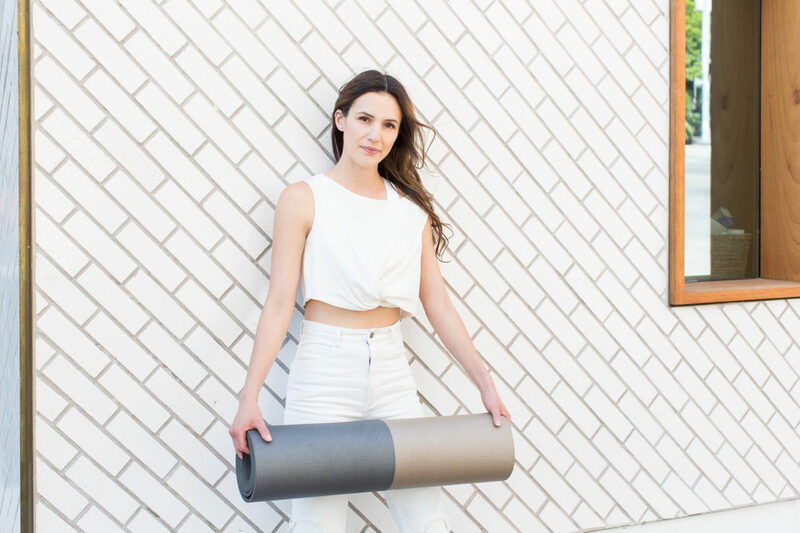 Questions: could you tell me a good brand of a yoga mat? I have been a fan for a couple of years now. I just finished your 30-Day Yoga Revolution about a week and half ago and I loved it! 😀 I also love how you interact with us! I have some leg problems (a boring story that I will not share here, but will be happy to if you are interested) and doing other sports when I was in middle school was hard on me. But when I found yoga a couple of years ago at college I just fell in love. However, I lost touch with yoga about a year ago (life got busy), but I decided to pick up again this year. Thanks to you, you made that possible, so thank you for that! You make me feel like I can do anything! I really like these little quickie yoga videos, but I was wondering if you had any other suggestions to do yoga everyday? I really want to connect with my mind and body, I have been doing some mediation and these yoga videos. However, I want a little more. Should we watch your 30-Day videos again? Or should I plan out my own yoga routine, if so how do I go about that? Thank you so much for all of these lovely and mindfull newsletters. To me Yogi Bhajan’s quote is a powerfull one and it really does make sense. Again, thank you. Thank you for sharing everything you share on the web. Your classes and your soul make me feel better. Really appreciate the short yoga videos. Have you ever considered doing one for equestrians? It’s been very uplifting to join you and your community on the mat everyday- I’m on Day 10 of your Revolution 31 day series – just completed my first 10 minute practice, and look forward to this daily routine of nurturing my body, mind, and soul! It was exactly what I needed, thank you so much for everything, Adriene, you changed my life and brought so much love and joy to me finally loving myself and my body <3 thank you <3 May all of your life be blessed with miracles and only miracles. Merci Adriene pour ces cours de yoga, pouvez vous parler plus doucement car ce n’est pas facile de tout comprendre. Thank you so much for your wonderful contributions! Love these, thanks for being awesome and sharing yourself. I look forward to my daily video (working through revolution at the moment). Just wanted to say thanks!! Hello Adriene. I want to thank you so much for your help. I just had finish the yoga revolution last week. I want you to know that for the last 31 days your were my best friend, i laugh, cried, and even had some epiphanies about the poses and the feeling related to the pose, funny that for two times when i had that epiphanies moments, you had deja vu feelings it happen in the revolution and the video yoga for fear. Some wyrd sync ah?! Lots of kisses, and hugs, and love and light!! Unfortunally I had to stop my yoga journey in the middle of the shine, now I’m craving to come back on the mat and shine with tools of yoga; I could never ever image to be so involved through yoga, to miss my little time on the mat so badly! Thank you for being you! I’m running a booth at a health and wellness fair next week at a university where I’m employed. I was wondering if you had any resources I could use? I love your yoga videos, and our booth is on physical activity. We’re incorporating yoga into that, and probably will give a couple demonstrations. I didn’t know if you had any flyers, brochures, etc. I’d like to be able to refer students to your videos for good home practice, as well! Thank you!!! I loved the 31 days this year, and this morning I felt so anxious, so I pulled this 10 mins out and voila! I feel calm and grateful all over again. Thank you so much for sharing your gift with all of us.